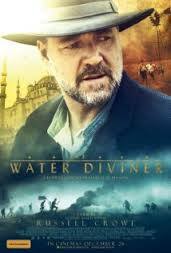 The Water Diviner starts promisingly, showing the final day of the Gallipoli campaign from the Turkish perspective as they charge the enemy trenches only to find the Australians retreating. In a time of much jingoism, we need to be reminded of the humanity of the ‘enemy’, and the strength of this film is that this is one of its major themes. Unfortunately, it has a kernel of interesting drama wrapped up in ridiculous action-heroics, at times degenerating into Indiana Jones. Russell Crowe plays an Australian farmer, Joshua Connor, arriving in Turkey after World War One to bring back the bodies of his three sons. It paints Turkey by numbers, with an obligatory chase through a crowded market and a chase across rooftops (oh! it makes me groan to think of it), and even a massacre of an entire trainload of people, with the exception of Connor and his new Turkish friend, Major Hasan. It’s a film which overplays almost every scene, and neglects all the potential for adult drama. The difficult reconciliation between the Australian Connor and the Turkish Hasan is overshadowed by them being caught up in a new war with the Greeks. (It may be a historically plausible detail; that doesn’t make it a good plot decision.) In a rather mystical moment, Connor locates the bodies of his sons with his water divining skills. At this point one begins to wonder if he actually is a superhero in disguise. The mystery of the fate of the third son is under-explored and rushed through at the end. Again and again, it is a film which veers awkwardly between an attempt at adult drama, an action movie, and a romance. It feels like a film financed by Channel Seven with James Packer as an executive producer… oh wait, it is! It’s a crowd-pleaser, and many will go away cheering. I do think it’s better that they cheer this, an Australian production with important themes, than an American equivalent. Nathan, you should have looked up “water divining” before you went to see this ‘McDonald’s’ take on WW1 history. You can find water divining and “F” for fraud.